Zinsser Mold Killing Paint Primer. Zinsser Mold Killing Primer is an interior/exterior primer that contains an antimicrobial fungicide to kill existing mold, mildew, or odor causing bacteria and prevent growth in the future. It dries to touch in 30 minutes and can be topcoated in one hour. 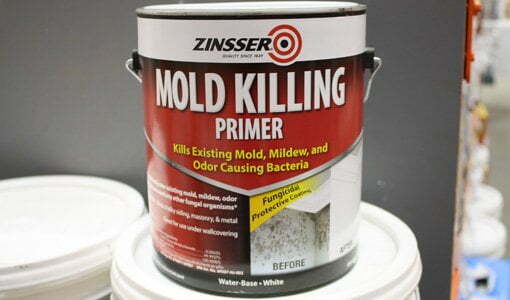 Zinsser Mold Killing Primer is available at The Home Depot. Watch this video to find out more. Jodi Marks: I think the reason why painting projects get voted the number one DIY project—especially for beginners—is it is so easy to do, you get instant results, and you don’t have to have elaborate tools to get those beautiful results. But you want to make sure that you get your surface prepped properly so that you get a nice finish. Now, sometimes, you might run into problems like mold. Well, what do you do? This is what you do. Here’s the answer to it. You get a mold-killing primer, and this is one by Zinsser. It’s very easy to use. It’s a water base, but it does have an anti-microbial formula in there so that it kills the mold and the mildew on contact. So, that means that if you’ve got drywall or you’ve got a ceiling that has moisture that is creating this mold and the mildew, you don’t have to destroy that first and then prime over it. All you got to do is use this primer. Go right over it. It will kill it, and then it will coat it, and then you can put on your beautiful top coat and change the look of that room in no time. Can you mix half & half together the Zinner Mold killing primer with a Latex Paint & just use it as a one coat, instead of doing each paint in 2 coats? Thank you, for your advise. This is a outside covered high ceiling porch, I would like to shorten my work time, if at all possible. Why does it take 7-Days for Zinsser mold killing primer to fully cure ? Does this mean it should not be painted or primed over before 7-Days with a different product.? The container is not clear on this. Hi, Barbara. You can use Mold Killing Primer on non-porous interior and exterior surfaces. So it depends on the type of wallpaper you have. If it is non-porous, you can use this with no problem. If it is porous, we do recommend removing the wallpaper first. Good luck! We have a clothes cupboard at our cottage that smells quite mouldy. Unfortunately the entire cupboard has been wallpapered inside for 50 years! It would be very difficult to remove the wallpaper. Could we paint over the wallpaper with this Zinsser product then paint over top? Would that solve the problem? I have mold in my garage on the block wall. Can I paint it first with mold killing paint and then dry-loc? Anything that you can do to block out the moisture from penetrating into your house will help and/or eliminate any mold or mildew in your home. You may also consider using a waterproofing coating such as UGL Drylok. I live in a cement block house that is bad about mold on the inside. I’m wondering if painting the outside with a mold killing paint will stop the mold on the inside?